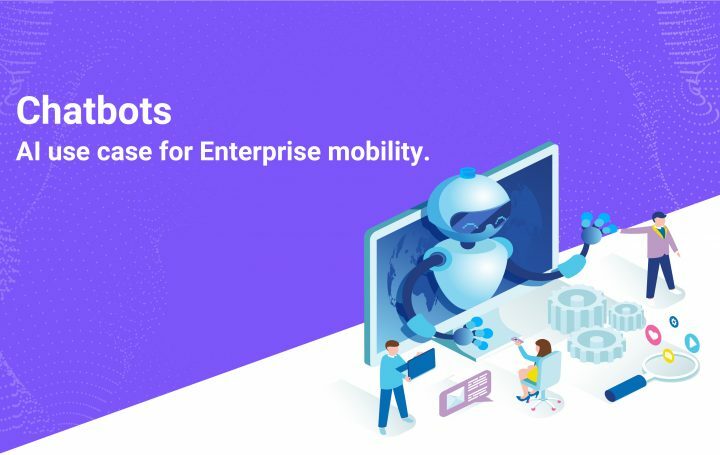 Chatbots – AI Use Case for Enterprise Mobility. Chatbots and Artificial Intelligence (AI) powered bots are already providing superior customer service with features such as 24-hour business support, instant response to simple queries, etc. Evolving technology has now taken customer service to the next level with virtual assistants which are software programs that help in performing tasks through voice commands. Siri and Alexa are examples of some of the popular household virtual assistants. Owing to their domestic success, these virtual chatbots are now taking steps to get associated with businesses. It is estimated that 80% of businesses want chatbots by 2020. Nowadays, many chatbot programs are available in the market, which can automate functions such as Human Resources, IT and Customer Service. One of the reasons businesses are turning towards virtual agents is enterprise mobility. Now what is enterprise mobility and how can chatbots/virtual agents help in achieving it? Enterprise mobility is a business approach where employees can function and get information from anywhere in the world. As businesses are spread across the world, there is a need for 24/7 business support. Additionally, coordinating and discussing between teams can become a difficult task. Also with the increase in workload there is a need for delegating mundane tasks to machines. This is where AI chatbots come into the picture. So, how are these chatbots helping enterprises to achieve enterprise mobility? Let us find out from the following use cases. Smart Assistants: Thanks to bots, you need not go through the hassle of reading through those long boring user manuals. They are now being replaced by interactive chatbots. For example, a car manufacturing company can use a chatbot, which could communicate with their new customers via email or text message. As soon as the customer purchases the car, this bot introduces itself and lists out the features and guidelines of the car. It even notifies the user about service date deadline, nearest service centers etc. Traffic and weather updates: Imagine you are running late for an important client meeting and need to find the shortest route to the client’s location. In such a hurry wouldn’t it be convenient to have a bot prompt about the traffic? Yes! Chatbots can also be used to prompt traffic and give weather updates. These bots when installed on your phone can give you real time traffic and weather updates of any place in the world. Lend a helping hand to the HR: Human Resources is one department that will be bombarded with questions both from the new hires as well as existing employees. Among these, many questions are repetitive which do not need human interaction. Observing this, enterprises are adopting chatbots to answer questions such as benefits, leaves, tax filings, exit interviews etc. Thanks to NLP (Natural Language Processing) the bots are able to mimic the conversation as if it were with a human. Assist Techies on field duty: Many companies need their engineers to work in precarious environments, where they might not be able to access their devices. In such situations a chatbot can be paired with a hands free device. To help the engineers to communicate with the back-end systems to ease various engagements such as, signaling the need for equipment repair, routine inspections and even take pictures and submit to the bot for step by step instructions. Training, Onboarding & Induction: Training is an important aspect in any business. Business can use chatbots to train their employees at a lesser cost maintaining the same efficiency when done using humans. All they need to do is, feed the training program into the bot and deploy it to their new hires and the rest is taken care by the AI. These are some of the many use cases where chatbots have proved to be an excellent addition. Although many enterprises have adopted this technology, there is still a long way to go. As this technology is still in its nascent stage, there is a lot of room for improvement. In near future we can expect to see chatbots handling not only simple tasks but also complex scenarios.